Hands free pocket free. Clip inside your boot for a night of dancing, or inside yoga pants for a quick run! It doesn't slip and is super convenient. 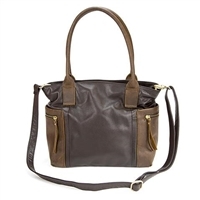 Perfect open bag style with a top zip closure. Detachable wristlet, and crossbody strap! All made In the sweet state of Texas. Shipment date depends on availability. If one needs to be made it may take between 4 and 6 weeks. This fun studded crossbody comes with a life time warranty through the manufacturer, it has a top zip, and back zip, as well as having two interior slid pockets there is an interior zip pocket.